Remember Mallomars? These cookies remind me a little of them, except instead of a graham cracker base, they have a chocolate cookie base which is crunchy on the outside and chewy on the inside. 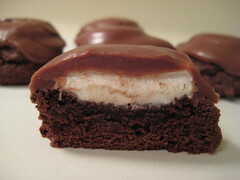 The marshmallow in the middle is a nice gooey surprise, and the chocolate frosting adds to their richness. Just some notes: The dough is very thick and fudge-like. I used non-fat milk because that’s what I had in the house and it worked just fine. I originally used a 1 3/4″ cookie scoop but decided on a smaller scoop midway through because my cookies didn’t spread much, they just puffed up. Also, I had a ton of frosting leftover! Preheat oven to 375 degrees. Make cookies: Sift together flour, cocoa powder, baking soda, and salt into a bowl. Using a tablespoon or 1 3/4-inch ice cream scoop, drop dough onto baking sheets lined with parchment paper, about 2 inches apart. Bake until cookies begin to spread and become firm, 8 to 10 minutes. Make frosting: Put confectioners’ sugar in a medium bowl. Melt butter with the cocoa powder in a saucepan over medium-low heat, stirring occasionally. Add butter mixture to the confectioners’ sugar. Whisk in the milk and vanilla. Spread about 1 tablespoon of frosting over each marshmallow, starting in the center and continuing outward until marshmallow is covered. Let stand until set, about 10 minutes, Cookies can be stored in single layers in airtight containers at room temperature up to 2 days. Recipe from The Cookbook Junkie. I never heard of Mallomars but these so remind me of the old wagon wheels – just puffier. I could probably dispense with about 6 of those babies. please excuse me while i go get a towel to wipe the drool off my keyboard….wow. these look yummy. Your pic looks so much better than mine. They were substantial, using the bigger scoop. My son ate his with a fork. He was asking for these cookies well after they were all gone. AMAZING… these look like thick brownie cookies with a good layer of ganach-ey icing! YUM. i feel soooo hungry now!!! I made these recently (well, I made the dough, then my daughter baked them and frosted them and took all the credit!) and they are good. You do have to have a sweet a tooth to like these, but they are really good. So cute! They look better then the original Mallowmars. Aw those look so cool! These look sooo yummy! Love the photo! These are what we call Teacakes in the UK – you can buy Tunnock’s Teacakes individually wrapped in seductive stripey foil! These look amazing! I might try these. Your blog is fully of yummy goodness! These look amazing! I came across the photo of this on flickr and decided to check out your site and it didn’t disappoint! I am going to try these for sure! Mouth-watery recipe. I love Mallomars since I was a child like I would rather trade it with other chocolates :). I am so excited to try this, my kids will surely love it. Thanks for posting.